Kari Byron’s story hasn’t been a straight line. She started out as a broke artist living in San Francisco, writing poems on a crowded bus on the way to one of her three jobs. Many curve balls, unexpected twists, and yes, literal and figurative explosions later, and she’s one of the world’s most respected women in science entertainment, blowing stuff up on national television and getting paid for it! 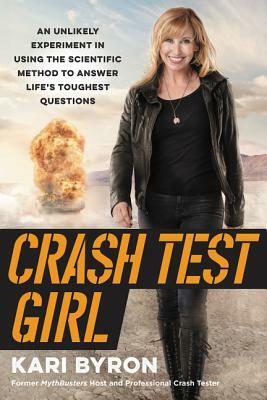 In Crash Test Girl, Kari reveals her fascinating life story on the set of MythBusters and beyond. With her signature gusto and roll-up-your-sleeves enthusiasm, she invites readers behind the duct tape and the dynamite, to the unlikely friendships and low-budget sets that turned a crazy idea into a famously inventive show with a rabid fanbase. Kari Byron has been the most recognizable, honored, and beloved woman in science-based reality TV for over a decade. She is best known as a host on Discovery ChannelMythBusters but has gone on to host and produce shows spanning several networks: Head Rush; Punkin Chunkin; Large, Dangerous Rocket Ships; Thrill Factor; Strange Trips; America Declassified; White Rabbit Project; and Positive Energy. Currently she lives in San Francisco with her husband, Paul, and daughter, Stella.